Dempsco at Automate Show with Micro Epsilon | Dempsco, Inc.
Dempsco is with Micro Epsilon at the Automate Show this week in Chicago. Stop by to see us at Booth #8351! 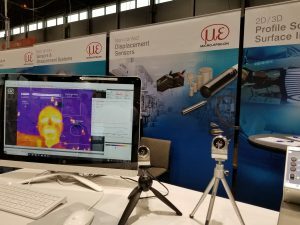 Our Bon Carter is at the Micro Epsilon booth having his face scanned with the Micro Epsilon TIM Thermal Imager.